“Les Jardins de Cérès” is an association, a group of people who gather as consumers, which make a local farmer produce goods under the circumstances (organic farming) they wish. Therefore the whole produce is bought in advance in order to “motivate” the farmer and garantee his economical benefits. Palaiseau is a small town in the suburbs of Paris, which has becoming more and more industrialised. Lots of green areas around Palaiseau disappeared during the last few decades and enormous shopping malls and industrial areas have grown to eat into local farmers lands. Therefore several associations were founded in order to protest against these developments. Isabelle Morgan (living in the neighbourhood of Palaiseau with her family) joined a demonstration organised by the association ASEVI (Association pour la Sauvegarde de l’Environnement à Villebon) against the construction of a new shopping centre, which was built on a huge stud farm. As Ms. Morgan realised that solely protesting against this development was not contributing to any solution, she decided to organise constructive and positive actions with the aim of offering alternatives. Meetings with friends and people close to her family took place in order to discuss possible solutions. The first idea was to link existing associations, which hadn’t collaborated at all so far, in order to increase the impact of their actions. During the process of contacting the different associations they heard about the “CSA” (Community Supported Agriculture) in the USA and got interested in this model as a solution for their problem. Looking for similar organisations in France they found the “AMAP” (Association pour le Maintient de l’Agriculture Paysanne) in Southern France. An AMAP is an association (type loi 1901) that is grouping consumers to an individual farmer. Through creating this direct producer/consumer-link the farmers can sell their products for a good price and continue their business under better conditions; the customers can buy locally produced products of high quality for a good price. By improving the economic situation of the farmer these organisations are providing a possible solution to slowing down green field industrialisation. After contacting several farmers in the region of Palaiseau, Isabelle Morgan and her friends met Emmanuel Vandame, a farmer who was willing to try such a venture.The association “Les Jardins des Cérès” was founded in December 2003. The association is inspired by “AMAP”, which have been well known for some years in the southern areas of France. An “AMAP” is basically a group of customers (organised by the farmer), which are buying goods from one particular farm. In this system the customers adjust their demand accordingly to what the farmer is able to offer during certain times of the year. As “AMAP” is not a well known case in the region of Paris the members of “Les Jardins des Cérès” were looking themselves for a producing farmer and asked for a previously evaluated amount of production. The farmer is usually growing cereals on an area of 250 hectares through conventional farming methods and would be willing to attempt organic production with the simplest crop- potatoes. For the first year of its existence the association with its 150 members ordered a batch of three tons of potatoes, which were to be grown on the “Plateau de Saclay” close to Palaiseau. The members of the association helped the farmer during several steps of the potato growing process: they cleaned and formed storage places in the cellar (400 years old) of the farm, they helped planting the potatoes, they helped taking care of them and finally helped in the harvesting process. During the activities at the farm, the members of the association and the farmer developed a close relationship. Producing three tons of potatoes was a good way of creating a social network, where people share their environmental convictions, experiences and ways of life. The association doesn’t get any external financial support: the members pay a yearly fee of 10 Euros for financing the internal organisation (renting a meeting room, telephone calls, internet connection…) and the external communication (leaflets, webpage). The production of the potatoes was paid in three parts: first third in advance to support the farmer buying the plant-potatoes and the tools, necessary for starting the organic production; the second third was paid half way through production and the third part was paid when the potatoes were harvested successfully. The price for one kilo was evaluated in advance by taking the average price of organic potatoes and stated at 1,60 Euro. “Les Jardins de Cérès” is first of all an elective community. The members joined in order to share their environmental convictions and together initiate a movement in Palaiseau which contributes to a more sustainable lifestyle. 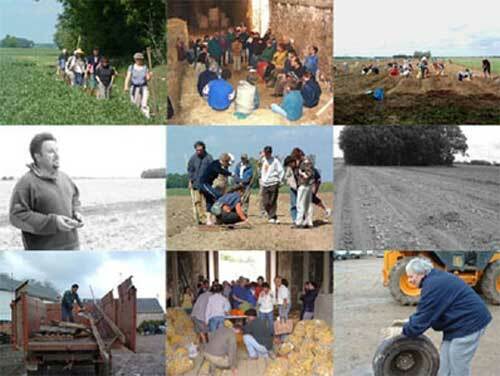 The members very much enjoy the social network in the association and organise the necessary work on the fields as a celebration of the process. They are very aware that the project needs social connections in order to work. On a personal level each member benefits by having food of high quality from local production. Taking part in the associations’ activities (organisational meetings as well as help on the fields) they are committing to their values and by that fulfilling a very personal need. Knowing the producing farmer is also a benefit for the consumers as for the farmer himself. The farmer said that he would very much enjoy knowing who is consuming his production. Having contact with people interested in his work is a real pleasure. So far, he mostly had contact with people, besides sitting alone on his tractor, when they came to complain about too much noise or bad smell. On one hand the project offers an alternative to the industrialisation in the area of Palaiseau, while also supporting and developing local organic agriculture. – By offering the farmer a good price for his produce the association gives the him an opportunity to earn his living. In a better economic situation the farmer is not forced to sell his lands to companies driving the overdevelopment of green-field sites. The project supports keeping green areas in the surroundings of the town. – The association initiated the attempt to organically cultivate potatoes. The farmer, who so far grows mostly cereals in a conventional way, is now interested in expanding organic cultivation step by step. Besides the direct environmental benefits of organic agriculture the association promotes the local agriculture with a direct producer-consumer-link and so reducing the transport distance of produce. The economical benefit in the first year was mostly on the side of the farmer. The members of the association decided to pay the “shop-price” for the production in order to enable the farmer to start off with the organic production of the potatoes (buying tools, gaining knowledge…). In the following years they will steadily decrease the price so that the economical benefit is also on the side of the consumers.